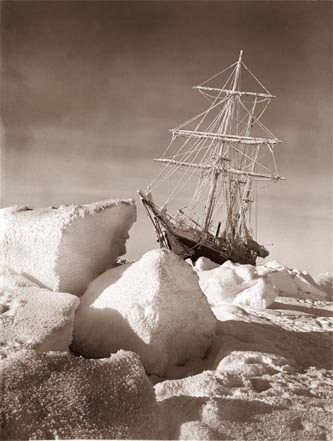 "I have two books on Shackleton's adventures and cant believe they haven't done a full-blown out Hollywood production on his life story yet! When I was in New Zealand there was this amazing world travelling show 'Endurance' that had stopped for a few weeks at the Wellington museum which had two full floor displays off memorabilia,books,clothes and even the small little lifeboat the James Chaird (if memory serves me correctly) from Elephant Island was there at the exhibition in its full restored glory! And his granddaughter gave a talk too. One of the highlights of the trip for NZ!" Hey JM! I was lucky enough to see this exhibit, too; at the Dublin Nat'l Museum @ Collins Barracks. Wasn't it fantastic? Good memory -- the lifeboat was called the James Caird!